Get in control of your business with TOPS towing management software. As the most full featured and flexible towing management software available, TOPS provides powerful tools to help you manage your business. Let your staff work smarter with features like automated pricing, inventory management, and lien and auction processing. Ensure employee accountability with features such as tow ticket management, the driver checkout system and release clerk payment management. Gain a better understanding of your business with detailed management reports for sales activity, truck and driver productivity, customer activity, and much more. With TOPS hosting service, pay only for what you need, and never get locked into an expensive dispatch system you paid for up front. Our hosted service allows you to easily adjust your needs on a monthly basis, keeping your cost affordable and never requiring a large up front fee. 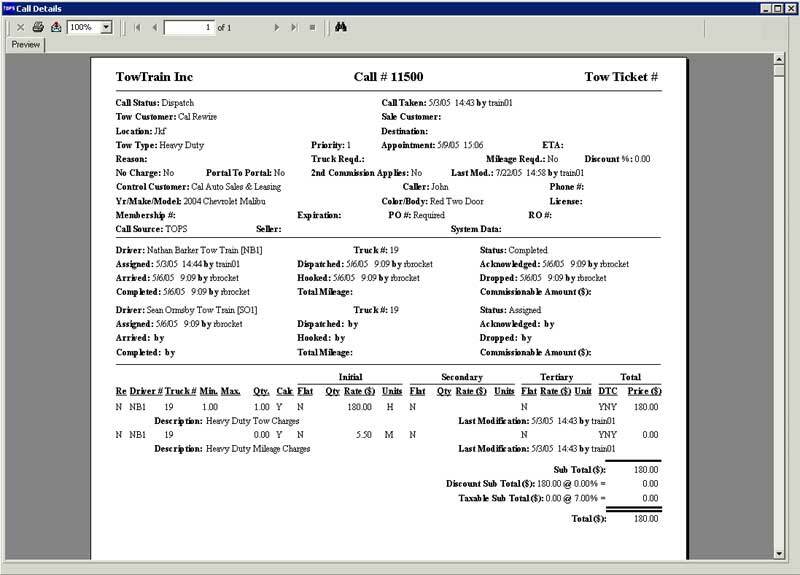 Supports call taking for a single company or multi-company operations from one screen. 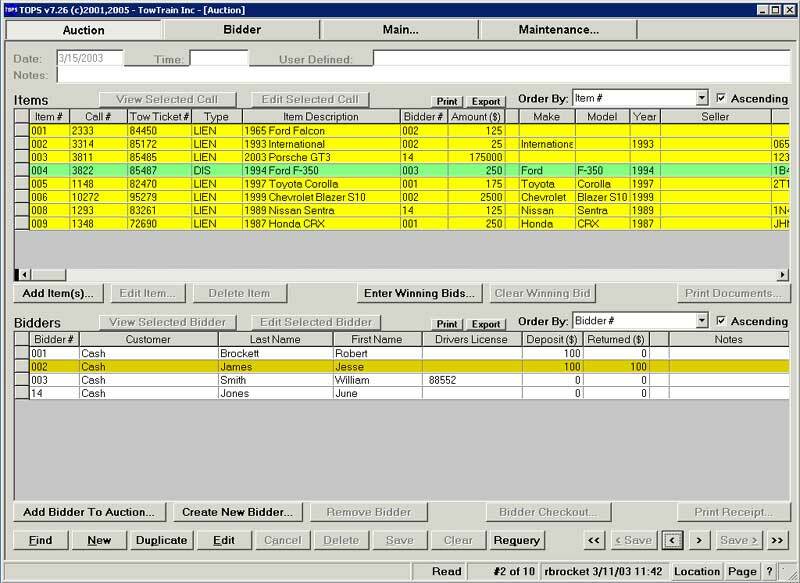 Speeds call entry by auto-populating call information based on customer profile. Improves accuracy by pre-filling Pickup and Drop locations, Tow Types, Notes to Call Takers, Dispatchers and Drivers, PO Requirements, and many other fields. Utilizes type ahead, short coding and drop-down menus for ease of use. User-customizable fields allow you to adjust TOPS to fit your needs. Special features to support quick entry of after-hours calls for non-24/7 operations. User-Customizable Dispatch screen to fit the needs of each member of your dispatch team. Create common views to support specific aspects of your business. 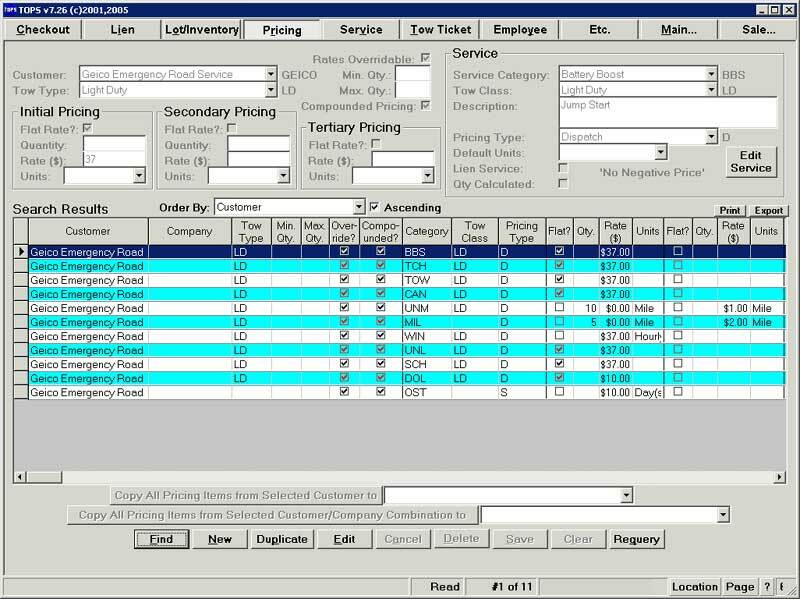 Customizable filters allow for division of duties by multiple criteria (zones, service type, responsibilities, etc) in any dispatcher environment. 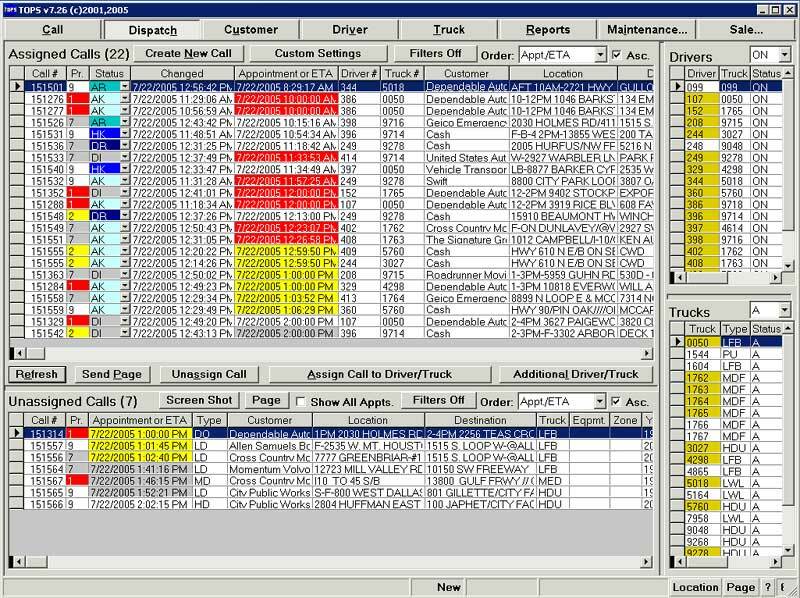 Create and save unlimited views based on individual dispatcher needs and preferences. Supports assigning multiple drivers to a single call and tracks individual driver�s work and commissions all on one call record. Tracking of Drivers and Trucks by Status (Available, Off Duty, On Break, etc). Initial assignment, reassignments and changes can all be sent to the affected drivers via pager, mobile phone, smart phone, tablet or MDT. TOPS Driver mobile application allows drivers with web enabled smart phones and tablets to take advantage of advanced mobile call management. 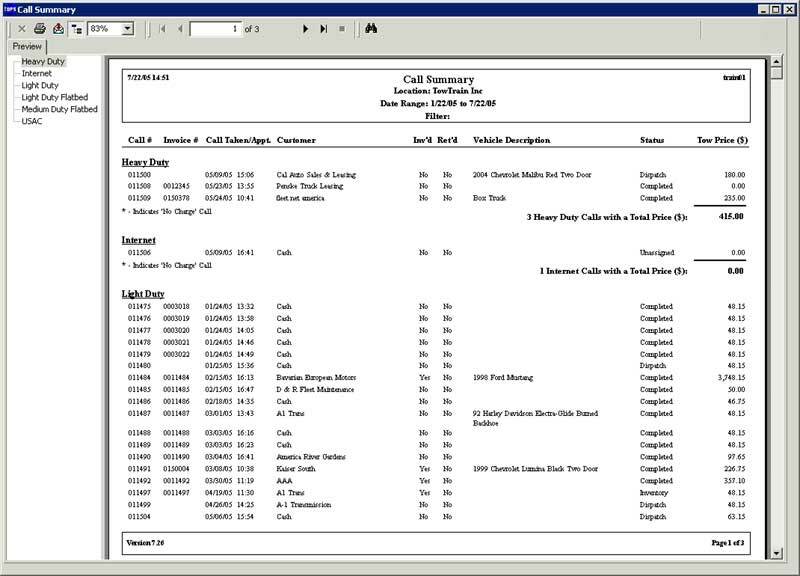 Update call data and dispatch times in real time. Scan VINs and decode vehicle information, improving accuracy. Upload photos of the vehicle and situation directly to the permanent call record while on the scene. Support for individual and group messaging to pagers, cell phones, smart phones, tablets, etc... - any device capable of receiving e-mail messages. Support for two-way messaging between dispatch and drivers with two-way capable devices via e-mail. Customer, Employee, Truck and Driver data is conveniently stored and easily retrieved. Driver and Truck screens allow easy access to detailed call information. User-customizable fields allow you to adjust TOPS to fit the needs of your operation. Default pricing allows for simple management of standard rates and discounts. Customer-Specific pricing allows for special rates and discounts, including multi-company environments. Automatically add pricing to calls based on a variety of criteria including call events, specific customers, customer types, call reasons, service type, time of day, and many more. 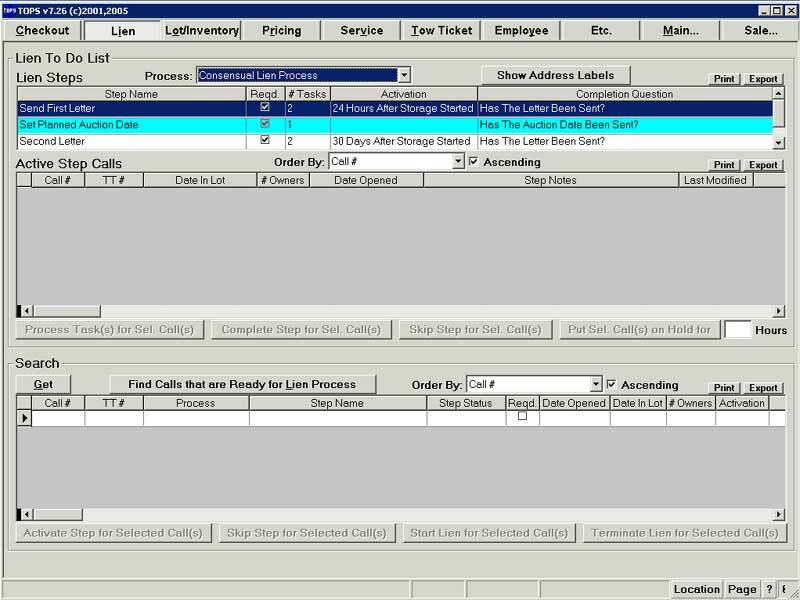 Makes the call taking and dispatching process more efficient by systematically pricing the calls correctly - every time. 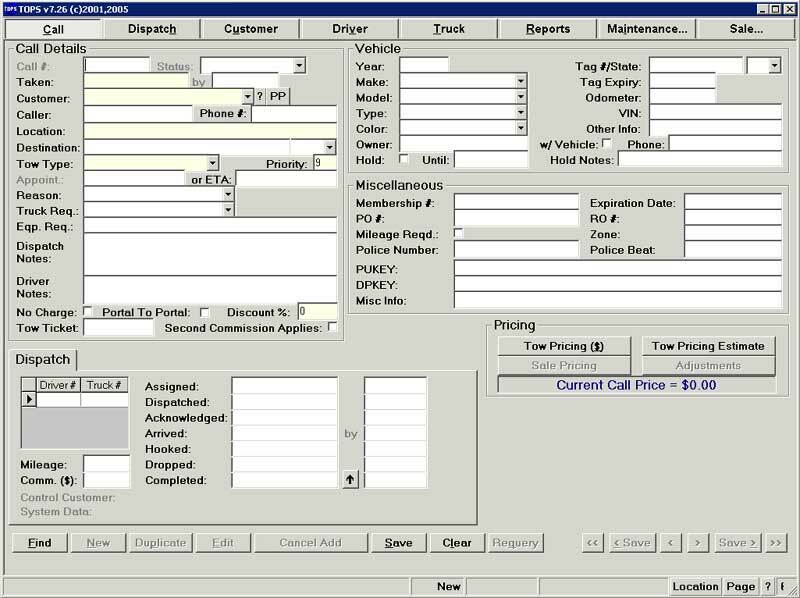 Allows for management control of driver tickets and ticket book assignments. Automatic driver ticket status updates and validation. Verify that drivers receive AND USE all of the tickets that are assigned to them. Easy to use management screen and exception report to help you manage and control this very important aspect your business. Allows office personnel to quickly check in driver paperwork and monies to verify its accuracy within the system, insuring that the information that moves to accounting is accurate. Utilizes a process that allows for cash oversight through a virtual till. Provides a snapshot of paperwork outstanding from each employee. Holds employees accountable for all monies received, regardless of how or when. Allows for customized processing based on state and local guidelines. Step by step processing helps guide users through the lien process steps. Liens can be processed individually or in batch mode, saving time when processing multiple liens. Management of critical dates to keep users informed of upcoming events in the lien process. Shifts much of the required lien knowledge from your personnel to your system, allowing for easy cross-training of duties. Print registered letters, State forms, court documents, and even mailing labels - all with the click of a button. Fully integrated with the Dispatch system, eliminating the need to re-enter data. Inventory and auction lot management. Customer, seller, and bidder management. Simplified bidder check-in, deposit, and check out at auction time. Allows for sale of vehicles not processed through dispatch and lien, such as consignment vehicles and charity donations. Consolidates purchases for Bidder checkout after the auction. Manages complicated state calculations for overages and remittances. Integrated NMVTIS reporting of salvage vehicles. TOPS is packed with business management reports showing sales activity, revenue generation, truck and driver productivity, customer activity and more - all as standard. 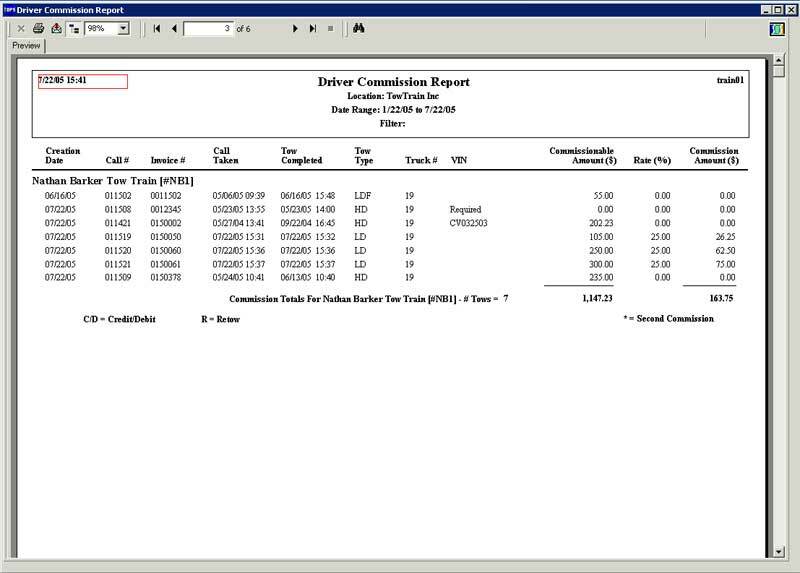 Custom reports can be created to support any and all parts of your business, in both paper and electronic form. TOPS Simple Billing allows for full accounts receivable management including invoices, statements, aging and reporting to feed your financials accounting program. TOPS supports full integration with QuickBooks Pro and QuickBooks Premier allowing an additional level of accountability including invoices, statements, customer management, monies management all which feed your corporate financials.